MINNEAPOLIS (April 13, 2013) – Monster Energy AMA Supercross, an FIM World Championship, made its return to Minneapolis’ Hubert H. Humphrey Metrodome on Saturday night for the first time since the 2008 season. 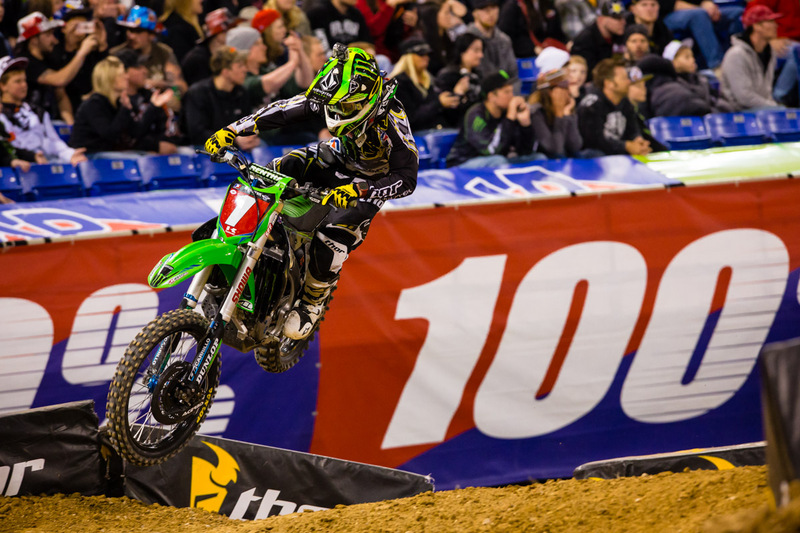 A crowd of 48,846 was on hand for the 14th race of the 2013 season to watch Minnesota native Ryan Dungey, from nearby Belle Plaine, outduel Monster Energy Kawasaki’s Ryan Villopoto for his second victory of the season. In the 250SX Class, Marvin Musquin made it a sweep for Red Bull KTM by claiming his fourth win in five races with a wire-to-wire effort. MotoConcepts Racing’s Mike Alessi grabbed the Nuclear Cowboyz® Holeshot Award to open the 450SX Class Main Event, but it didn’t take long for Villopoto, the championship leader, to take over the lead. Dungey followed past Alessi moments later and set the stage for a captivating 20-lap Main Event. Villopoto and Dungey set a strong pace early and eventually opened a lead over Rockstar Energy Racing’s Davi Millsaps in third place. They stayed about a second apart for the first 15 laps before Dungey gained ground on Lap 15 when he and Villopoto encountered lappers. On Lap 16, Dungey got alongside Villopoto and took over the lead crossing the finish as the crowd erupted. The duo kept the crowd on its feet when Villopoto passed Dungey back for the top spot just after the start straight. Dungey moved alongside Villopoto after the track’s first rhythm section and they stayed that way for a third of a lap before Dungey reclaimed the position for good, earning his 13th-career 450SX Class win. 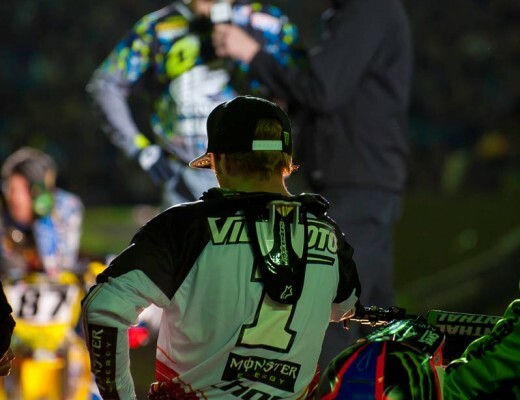 Villopoto carried a five-race winning streak into the evening, but the runner-up finish still gives him first or second-place results over the last eight weeks. 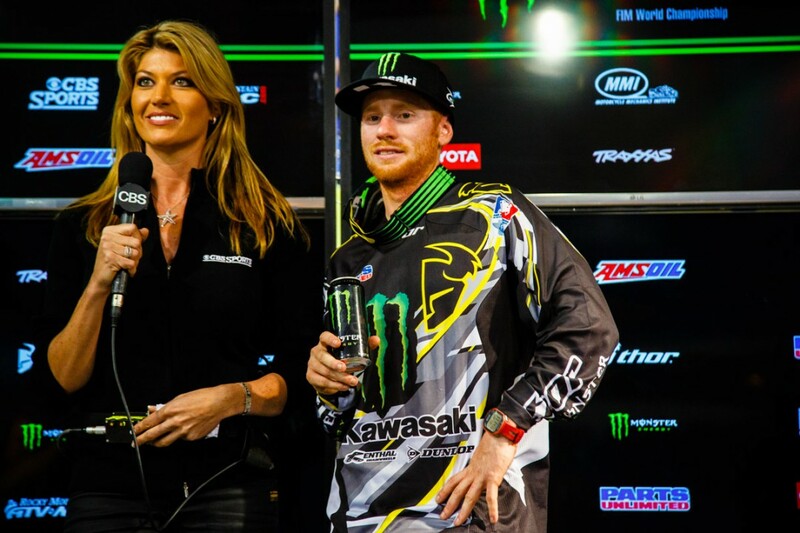 Millsaps rounded out the podium in third and lost some ground in the championship. Villopoto maintained his points lead heading into his home race next weekend and now sits 22 points ahead of Dungey, who moved past Millsaps into second. In the 250SX Class Main Event, Musquin took the lead out of the first corner to claim the Nuclear Cowboyz Holeshot Award. Behind him, several riders jockeyed for position with GEICO Honda’s Wil Hahn, the championship leader, and Rockstar Energy Racing’s Blake Wharton assuming second and third, respectively. Shortly thereafter, Hahn and Wharton began to battle for position, which allowed Musquin to open a significant gap over the field. Hahn eventually put some distance on Wharton for second, while Monster Energy/Pro Circuit/Kawasaki’s Tyler Bowers, the reigning three-time AMSOIL Arenacross Champion, closed in on third. Bowers made an aggressive pass on Wharton on Lap 2, but the two stayed mere bike lengths apart. On Lap 7, Wharton gained an advantage coming out of the whoops and moved inside Bowers heading into the following turn. Bowers attempted to maintain his line, causing the two to make contact and sending Bowers to the ground. He remounted in fifth and would remain there for the remainder of the race. Musquin led all 15 laps and won by more than eight seconds. Hahn finished second with Wharton in third. “I’ve been strong and been confident. I’m bummed I haven’t been able to get a win, but it was still a good night. We have the points lead and we’re ready to go win this thing in Vegas. Hahn’s lead in the Eastern Regional 250SX Class Championship now sits at five points over Musquin as both riders search for their first career Monster Energy Supercross titles. The riders will take a break from competition for the next two weeks before returning to action on Saturday, May 4, for the season finale in Las Vegas. Tonight’s 450SX Class race will air on CBS tomorrow Noon ET, and the 250SX Class will air tomorrow at 4:30 p.m. ET. 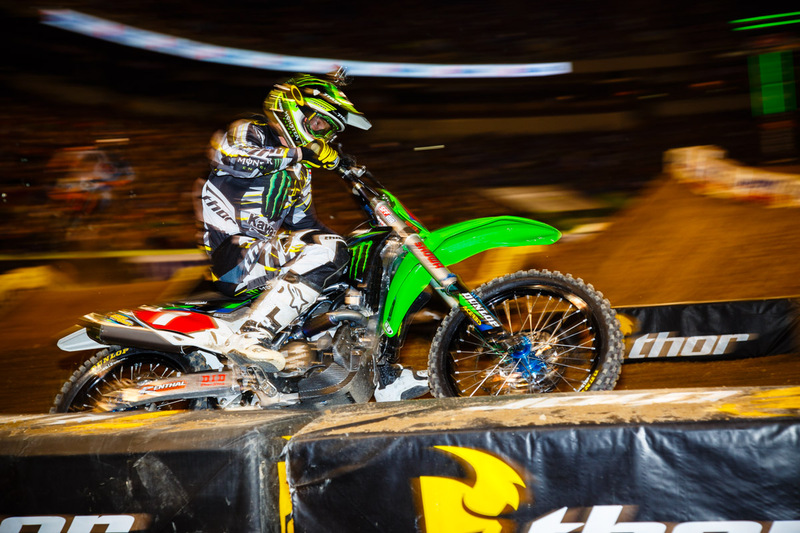 Monster Energy Supercross makes its return to the West Coast next Saturday, April 20, from Seattle’s CenturyLink Field.